Take a small plate and add a small layer of fine sugar. Rub glass rims with lemon, then dip rims in plate so sugar adheres. 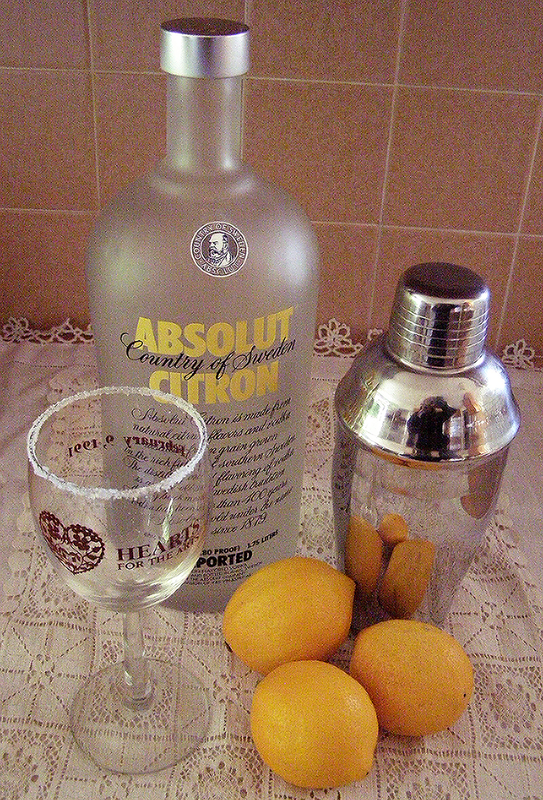 Add vodka, lemon juice, simple sugar syrup, and ice to cocktail shaker. Shake a minute or so until frosty cold. Pour into glasses. *Simple sugar syrup is available in stores, but easy and cheap to make yourself. Bring 1 part water to boil, add 2 parts sugar, stirring constantly. Once sugar is dissolved, remove from heat immediately. Pour into heatproof storage dish and allow to thicken and cool. You can store this in the refrigerator. I’m not sure of its shelf life, but have read that adding a little vodka prolongs it. Bring to room temperature before using in drinks.